More Benghazi whistleblowers are coming forward according to two former U.S. diplomats. According to the former diplomats, these whistleblowers are obtaining legal counsel because they are not protected by whistleblower laws in the areas that they work in. Now this is interesting in light of the fact that Greg Hicks, the deputy chief of mission in Libya, testified before Congress on May 8, testified that Stevens was sent to Benghazi by Clinton to convert the outpost into a permanent diplomatic facility. “He further testified that in May 2012, during his exit with Secretary Clinton following his being sworn in as U.S. Ambassador for Libya, Stevens promised he would give a priority to making sure the U.S. facility at Benghazi was transformed into a permanent constituent post,” Corsi added. While damaging to Clinton, it was omitted from the State Department’s Accountability Review Board report. Obviously that would add credibility to Raymond Maxwell’s claims that he believes that Clinton and her staff were running the show on the ARB report’s investigation, not an independent board. Should these claims be brought to light, they would be far more explosive than Hicks’ testimony. It also would add credibility to the theory that the Obama administration was running an international Fast and Furious program. According to one of the former diplomats, he believes that what took place is similar to the Mike Nichols film Charlie Wilson’s War, which is about a clueless congressman who supplies Stinger missiles to Afghan guerrillas. “It’s as if Hillary and the others just watched that movie and said ‘Hey, let’s do that!’” the diplomat said. He also believes the leaked emails about former CIA director David Petraeus’s adultery with his biographer Paula Broadwell was intended to silence him., especially since Petraeus had stated that the command to stand down could have only come from Barack Obama. 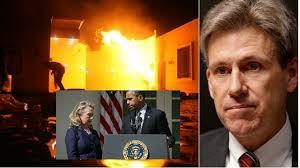 Petraeustestified that he knew Benghazi was terrorist attack instantly. Apparently General Ham was told by the White House not to send aid to the men under attack in Benghazi, but he disobeyed the orders. However, the White House then “called his deputy and had the deputy threaten to relieve Ham of his command,” according to the diplomat. Ham quietly retired as head of AFRICOM in April 2013.